YOU are an inspiration…your story can encourage and inspire other women & girls. The expectations and demands on women & girls around the world are high and, often times, seem unachievable. But women & girls frequently experience breakthrough moments of self-acceptance, self-confidence and self-love, moments when they overcome the expectations of others and decide to live their lives as they choose. When women & girls share their stories of personal triumph, they often find that telling their story is itself an act of self-empowerment. And then others are inspired and changed by reading real stories of overcoming struggles with fear, with lapses of confidence, or with cultural norms. Sharing stories of personal triumph has the potential to give hope, to inspire, and to help change lives. Beyond encouraging and supporting storytelling as a tool for empowerment, we strive to increase awareness of organizations that work to advance the safety, health, education and empowerment of women & girls globally. 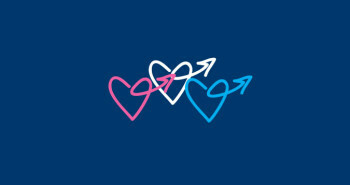 Some of these organizations are listed on the Engage page of this site. 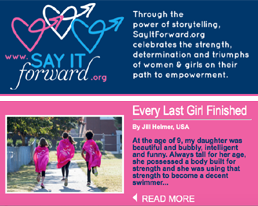 In each of our first three years, for every story posted on SayItForward.org, we made a cash contribution to an organization that supports women & girls in some way. The beneficiary in 2018 was the Women Deliver Young Leaders Program. Since 2010, the Women Deliver Young Leaders Program has trained, elevated, and empowered youth advocates to catalyze action for gender equality and the health, rights and wellbeing of girls and women. In 2018, Women Deliver was delighted to welcome its largest and most diverse class yet, 300 outstanding young people from over 100 countries. In celebration of the International Confederation of Midwives (ICM) Triennial Congress in 2017, Say It Forward donated funds to the ICM in recognition of their work in advancing and enhancing the reproductive health of women, their newborns and their families globally. The ICM supports, represents and works to strengthen professional associations of midwives throughout the world. The funds were used to enhance communication and collaboration between ICM’s Midwives Associations and to share and celebrate the wonderful diversity of the world’s midwives. At the end of 2016, we honored our commitment to the first beneficiary of Say It Forward, the FCI Program of Management Sciences for Health. The funds were used for initiatives strengthening and empowering communities of midwives in remote areas in Burkina Faso and in Bolivia. We continue to respect and admire their important work and are grateful for these photographs from the work we supported.